Combating unrealistic expectations: This is true for traditionally published authors as well. Superstar authors like Rowling who can afford their own castles are the very visible exception to the rule that writing a book, or several books, may not enable you to quit your day job. While cutting away the safety net may seem like a bold way to go "all in," it's not always wise, and being honest about how long "over night success" actually took can help those considering publishing as a main source of income plan their route. Stopping the naysayers: The flip side of the last item deals with the negative nellies you meet who think self-publishing is a money sink for people who don't really want to make a living off their writing. Since anyone can publish a book now, the "fail" rates are astronomical. Every writers' group I've ever been in has some dark prophet exclaiming how since they couldn't make it, no one can. However, 90% of the time questioning reveals one or multiple problems. They've never tried a promo site or have been advertising in ineffective ways. They did their own cover art or paid someone who gave them rushed out, unprofessional looking work. They have misspellings in their blurb or a badly phrased blurb. They don't know what keywords are or their reviews complain of bad editing. You get out what you put in, and sometimes these people work hard but not smart ... or they got taken in by a predatory vanity publisher or "publicist" who promised sales but just took their money ... or writing may simply not be their calling. Just because you want to do something very much doesn't mean you can be successful at it. There are things you can do to improve your chances, but what really brings success can be hard to pinpoint. Judging promo sites: There are a lot of sites out there clamoring for your money. Many claim to be able to move mountains of books. Not all actually work. Some work in a small way but won't get you your investment back. 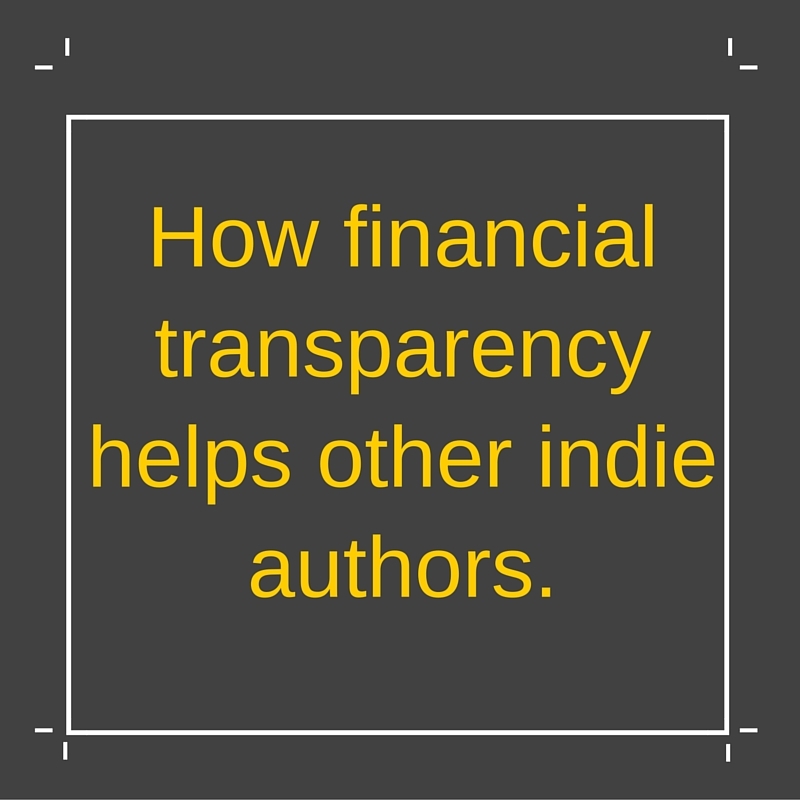 Being able to see the numbers an author got running a book through a particular promo site can help an author decide which to invest in (this is the main reason I share my sales data). So people know what to budget for expenses: You can self-publish for free. The rule of thumb for self-publishing is that you either pay for it, or you learn to do it yourself. Cover design, formatting, editing, promoting ... all of which can add up. Some of it you can do on your own if you have certain skills, or you can trade for it, or find other ways around the fees ... but this won't always be possible and skipping these steps or doing them shoddily because you don't want to spend money can cost you in eventual sales. 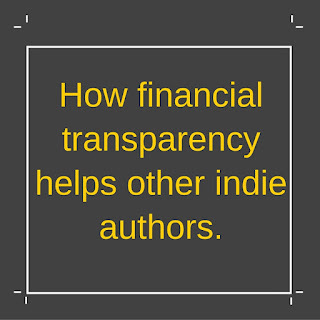 Allowing people to see how much you actually spent to get your book out there can be very helpful to someone getting started. So are their any down sides? Some writers don't want to share for fear of jealousy. This isn't unfounded. There is a small segment of authors who would rather bring down their "competition" than promote their own work. This is probably true in every community, but as authors, we work primarily online where it is fairly easy to torment another individual, leaving bad reviews on their work. I've seen some people share their details under fake names. This also has a flip side. Some new writers or writers who have been struggling but not hitting the numbers through no fault of their own, may be discouraged by seeing how well others are doing at the same business. Also, you could get audited. So pay your taxes. My main thought is that writers aren't really competing against each other. I've never known an author whose end goal was "I want readers to never read anyone elses' books ever, just mine." We can afford to help each other out, and sometimes that means sharing information about financial aspects. I know an indie writer who frequently shares the results as he experiments. Helping other indie's can judge for themselves strategies and so on. a lot of authors I know share their charts too. However, there is always someone in the group who accuses them of bragging, but dang, how are we supposed to know if their advice is actually good without knowing what their results were? Like if they said an ad really worked for them, but what they meant is, 'I hadn't sold a book all month and after that $20 ad I sold TWO!" Or if they didn't think the ad worked well, but they already make 100 sales a day and for them a couple dozen sales is chump change, that's also nice to know. Fall Into Reading: Clean Indie Reads Sale!